Empire of the Sun: It’s so scary it’s good. DEPARTED THE SHOW FEELING: Was this queen really just running around in his socks while rocking THAT outfit??! Ah, the place where homo meets bro ho, Club Nokia. 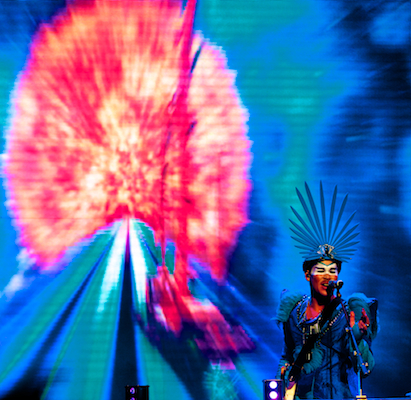 Tonight it is all about Empire of the Sun’s triumphant return to Los Angeles. First up, Mayor Hawthorne… wait… MAYOR HAWTHORNE??! Don’t get me wrong, I love me some grooves by the fierce white man but how does this genre relate to the sold-out headlining act? They must have the same manager or agent. Nice way to streamline the audiences guys. The Mayor was delicious and playful as always, getting the crowd bumpin’, groovin’, worked up and ready to go for some glitter and face paint. Empire takes the stage on head on and real strong. I mean the fist pumping I saw in the air… it was incredible! But really, the band was spot on, theatrical, and gorgeous. The homecoming set (cause really we know they are not from Australia… they are from Encino with a fake accent… the jig is up guys) was brought to a strange and complicated place as lead singer Luke Steele started what looked like a temper tantrum after a baby wet his pampers. It was camp, pure camp, but not camp like John Waters or well… John Waters, but instead more like… Deborah Gibson camp. Just sad. I left feeling like, really guys, can we just take it to the next level instead of stumping what would have been a show of peace, love, harmony, and glitter?! Le sigh. We’ll try again on the next tour. Portishead: Welcome back, we’ve missed yew. Asa takes on the US!